A high quality Mean Well brand three prong Wall plug, 60 watt Constant Voltage LED Power Supply which is suitable for dry locations and is capable of supplying power to 54 - 1 watt led modules or lights. 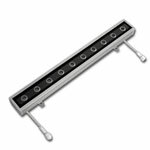 Use with any 100-240VAC input for a quick and easy installation of your 24VDC LED Strip Lights, LED Modules, and LED Lights. Comes with short circuit, overload, over voltage and over temperature shut off protection. It has a 5.5mm X 2.1mm Female Plug for the 24V connection. 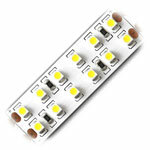 It can be used to connect LED Modules, LED Lights, LED Light Ribbons, RGB LED lighting and other LED Lighting products. One 5.5 X 2.1mm Male Barrel Jack with screw down terminals included. 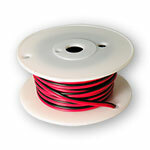 UL, RoHs and CE approved. 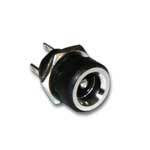 Dimensions 4.9" X 1.97" X 1.24"
This 5.5 X 2.1mm barrel jack connector has 12" - 22AWG lead wire attached. 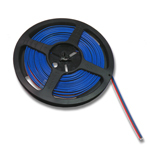 Can be used for many projects to add a power supply connection point or mate with a 5.5 X 2.1mm plug connector. Sold in sets of 3. Please note this adapter is only rated for a maximum of 5A.